Nucem Mortar is a pre-packed shrinkage compensated, polymer modified cement based mortar supplied with either an acrylic or SBR latex polymer. 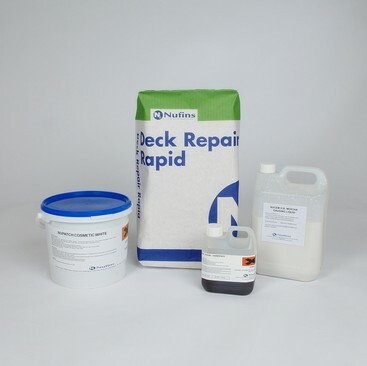 Nucem Mortar is formulated to comply with the requirements of EN1504 Part 3 Class R4 as well as conform to the DTp Model Specification for the 'Repair of Concrete Highway Structures' BD 27/86 Clause 6. It is based on Portland Cements complying with Clause 1702, DTp Specification for Highway Works and non reactive aggregates. Nucem Mortar is specially designed for the restoration of spalled and damaged concrete caused by reinforcement corrosion or frost attack. Repair of damaged insitu and precast concrete. Repair of damaged floors, bridge decks and road wearing surfaces. Screeding where abrasion and/or water resistance is required. Repairs to spalled columns and beams using formwork. Pack contains all constituents including gauging liquid. Excellent adhesion to dense concrete and steel etc. Contains no added chlorides, the total chloride ion content is less than 0.05%. Non-reactive aggregates in accordance with DTp Specification for Highway Works Clause 1704-6. All contents pre-weighed, dispensing with need for any measurement. Excellent workability and finishing properties. Good resistance to water, frost & salt penetration. Controlled Equivalent Sodium Oxide to less than 3 kg/m3. Manufactured under BSI QA Scheme, ISO 9001, EN 29001. Suitable for next day waterproofing. To download the Nucem Repair Mortar Technical Data Sheet click here. To download the Nucem Repair Mortar Safety Data Sheet click here.